My Nurgle army has gotten so large I never use most of it, many of the models are not currently legal under the current Chaos Codex. The biggest problem is the models don't look like they belong in the same squad. Real Soon Now I will touch up these models, add some more highlights and shading maybe some new detail work and they can become productive members of my army again, maybe even serve in another Grand Tournament. Some of these models are conversions of loyalists, the others are mostly unaligned chaos models that I have painted in a Nurgle color scheme. The vast, vast majority of these models are out of print, but for the most part they could be fielded in my army with the noteable exception of the models with heavy weapons. I previously stripped and repainted some of my out of print Plaguemarine models, stripping paint off takes a little work but especially for one piece metal models is doable. Plastic and multi-part models are likely to suffer a little more wear and tear but they can be whipped into shape. 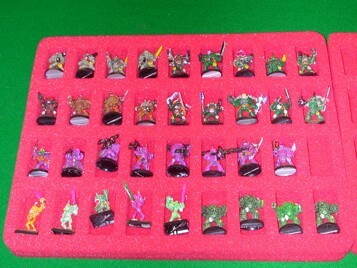 A lot of my rank and file miniatures were recycled some more than once.